News InterOcean Advises on Sale of Lanworth, Inc.
InterOcean Advises on Sale of Lanworth, Inc.
InterOcean Advisors LLC (“InterOcean”) announced today that Lanworth, Inc. (“Lanworth”), a subsidiary of The Westervelt Company, has been acquired by Thomson Reuters, a publicly traded company focused on providing intelligent information for businesses and professionals in the financial, legal, tax and accounting, healthcare, science and media markets. 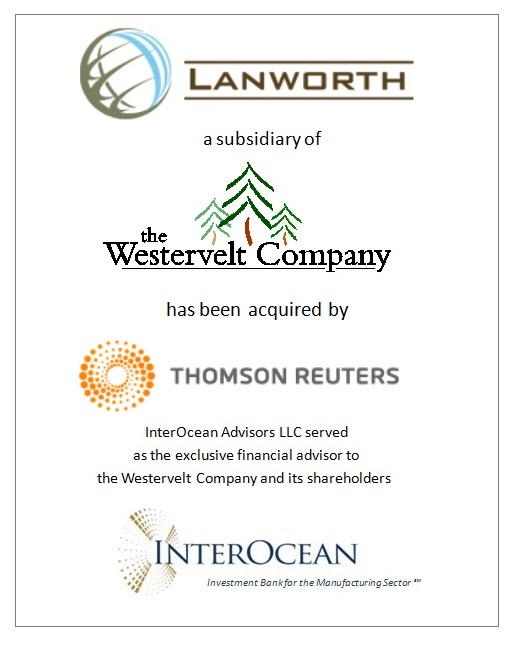 InterOcean served as the exclusive financial advisor to The Westervelt Company on the sale of Lanworth. Lanworth provides independent intelligence on global food, feed, fuel and fiber supplies by combining daily satellite feeds, ground observations and biophysical models. Its reports on crop planting and production mitigate market risk and improve supply chain operations. Lanworth has been in business for nearly 12 years and is located in Chicago, IL. “We are very excited about joining Thomson Reuters, which will propel Lanworth into new markets and facilitate the development of new products and services,” said Nick Kouchoukos, former president of Lanworth and incoming Global Head of Agricultural and Forestry Research for Thomson Reuters.